Is there a name for the point of a exponential curve where the y axis significantly increases? It's been hard to come up with a question title that makes sense so please bear with me. 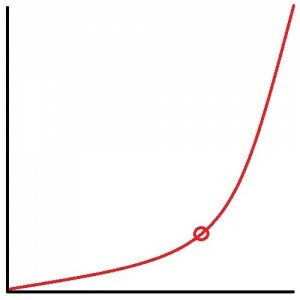 On an exponential curve there's a point on the x axis where the y axis starts increasing significantly. The exact location/ calculation of the point isn't important for my question. When people are talking about every day life that involve exponential curves we sometimes use terms like "hit a steep learning curve" to describe our experience of reaching this point. In calculus we use the term "inflection point" for when a curve changes between positive and negative. 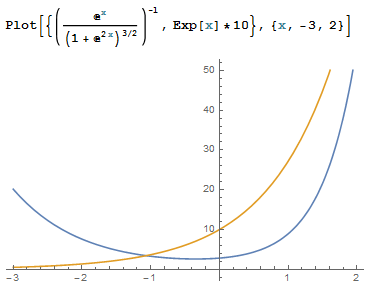 Is there also a term for the above point on the exponential curve? The English idiom is "the knee in the curve." This doesn't have much, if anything, to do with mathematics, however. For a good explanation of why it's a subjective issue and not a mathematical one, you can look at this article: http://www.growth-dynamics.com/articles/Kurzweil.htm About 1/3 down the page there are a few graphs one over the other with the title "where is the knee?" They have different $y$ axes, but show the same function. You can see that your $y$ axis determines where you think the "knee" should fall. This is an old question, but a very good rule of thumb for such a point would be the minimum of the radius of curvature function. Is there a name for these binary operations? 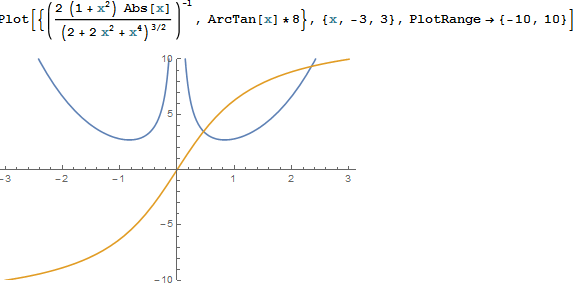 Where does the curve $x^y = y^x$ intersect itself? Where does the line intercept the $x$ and $y$ axis? Is there a name for this pattern involving the differences between perfect squares, cubes, etc? Are integrals taught in Precalculus? Finding the critical points of a function and the interval where it increases and decreases.